I was not supposed to color my nails red again. I tried the French manicure a couple of times before this. However, my nails were messy and sloppily painted on both attempts. Yeah, the trouble of painting your own nails. I didn't like it at all. I guess I'll try the French manicure after Christmas and stick with these frosted red nails in the meantime. This is my second bottle of red nail polish. THIS is the first one. 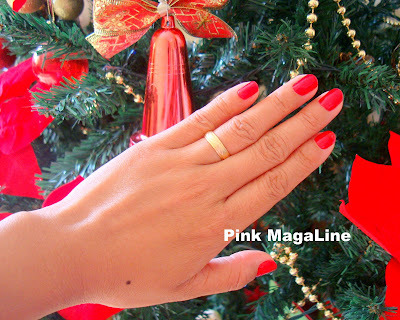 To attain this simple red frosted nail look, I first cleaned my nails and removed the existing color. Then, I used Caronia Desire Frosted evenly and thick enough so I didn't have to put a second coating. 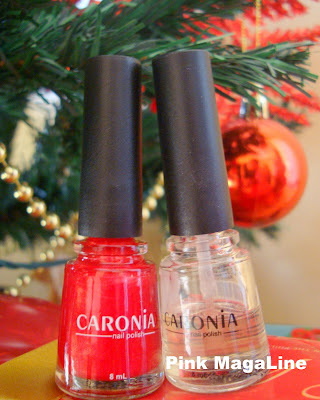 The next day, I covered the red polish with Caronia Colorless Regular for protection and longer life. I don't normally do this. Guess what.. I like it! My nails didn't chip right away and they are stronger than before. I think I'll have to do it this way everytime!! wow nice color perfect for the Christmas party natin!!! ganda ng red sis. :D bagay naman sa yo. i don't paint my fingernails anymore. daming housework! Nice color! perfect for the season. I love red on my nails din. I have other usage of that red nail color.. I'll be posting it soon on my fashion blog. Please visit me soon :).